Cool off with a Frozen Coke near Test Track. 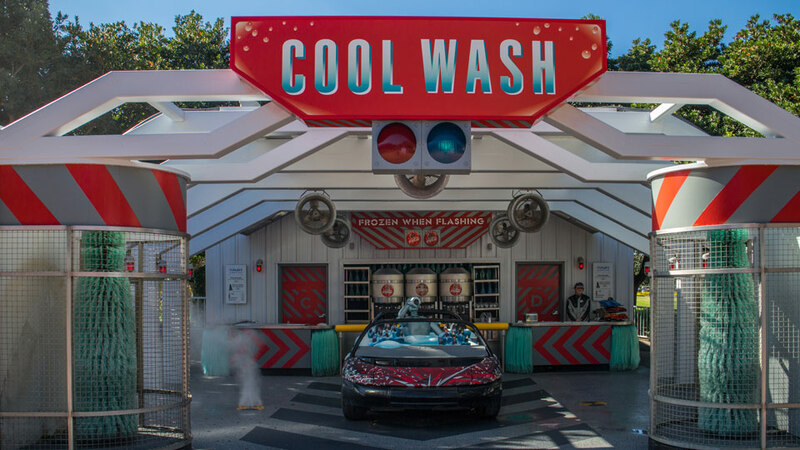 Located near the entrance to Test Track in Epcot’s Future World, Cool Wash can be easily found by its distinctive car wash theme. Just look for the crash test dummy drinking a coke in a frozen SimCar. This kiosk sells Frozen Coke or Frozen Raspberry Lemonade, which is a perfect treat on a hot day. Not only does it serve refreshing drinks, but Cool Wash is completely canopied by misters. If the scorching Orlando sun is beating down on you, then head to this Test Track misting station for some much needed relief from the heat. If you don’t want to get wet, then steer clear or send someone else in your party. Cool Wash also offers a Test Track Cone souvenir cup.